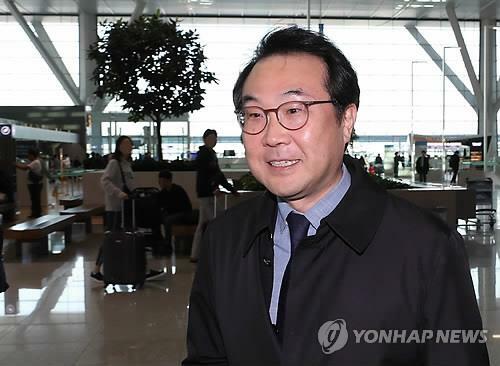 SEOUL, Oct. 21 (Yonhap) -- South Korea's top nuclear envoy left for the United States on Sunday to coordinate North Korea policy with Washington, Seoul's foreign ministry said. Lee Do-hoon, the country's representative for Korean Peninsula peace and security affairs, will visit Washington D.C. from Sunday to Tuesday to meet with his U.S. counterpart, Stephen Biegun. They are expected to discuss the progress of negotiations between the United States and North Korea, including preparations for a second summit between President Donald Trump and North Korean leader Kim Jong-un. U.S. Secretary of State Mike Pompeo said Friday said he hopes to meet with his North Korean counterpart "in the next week and a half or so" to continue planning for the summit between their leaders. "There are various dialogues and contacts under way between the U.S. and North Korea. I'll meet with Biegun to listen to Washington's plan and consult on how to push for the denuclearization (of the Korean Peninsula)," Lee told reporters at Incheon International Airport, west of Seoul. He said that denuclearization should be pursued on the basis of the Seoul-Washington alliance and with international support. As for potential talks between Biegun and North Korean Vice Foreign Minister Choe Son-hui, Lee said it is a matter of when such a meeting will be held, not whether it would be held. Pompeo made his fourth visit to Pyongyang earlier this month in an effort to revive stalled denuclearization talks with North Korea. The North is calling on the U.S. to declare an end to the 1950-53 Korean War and soften sanctions in response to Pyongyang's measures such as the demolition of its nuclear test site. But the U.S. demands more concrete steps toward denuclearization -- for example, the listing of its nuclear weapons. The two nuclear envoys may also exchange views on South Korea's hope that the U.S. could exempt inter-Korean cooperative projects from sanctions, diplomatic sources said. At high-level talks held last Monday, South and North Korea agreed to start a joint project to modernize and eventually connect their railways and roads across their borders in late November or early December. Washington remains cautious about inter-Korean economic cooperation, saying that any advancement in inter-Korean ties should be tied to progress on North Korea's denuclearization. Lee and Biegun will likely also share the outcome of their respective visits to China and Russia, as well as to Europe. The nuclear envoys have recently held a series of meetings in Seoul and New York to coordinate the allies' policy on North Korea.